Looking to get the most out of your digital business in 2015? Look no further than AIM’s upcoming Digital Training day! Working in conjunction with Motive Unknown, AIM have developed a daylong course focusing on how to get the most out of your digital business this year. Topics will cover a wide range of best online business and marketing practices, from how to maximize online advertising potential to emerging platforms, e-mail campaigns, social strategies and more. Not only will attendees learn about how to grow their social networks and web revenue, they will also learn how to analyze this data so it can be used to determine the value of your digital marketing initiatives. The AIM Digital Training Day will take place on Tuesday, February 3rd from 10AM to 5:30PM at the Association of Independent Music offices in London. Tickets are £70 + VAT for AIM Members, and £140 + VAT for non-members. 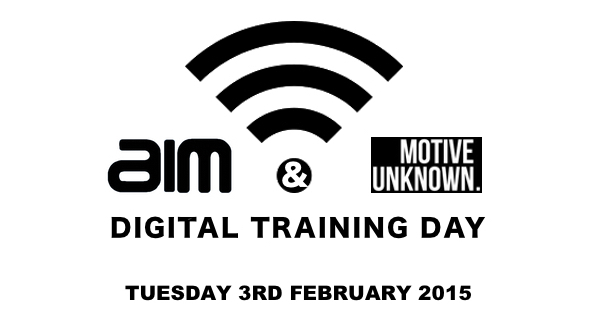 To register and learn more about the AIM Digital Training Day in conjunction with Motive Unknown, follow the links below.